Researchers have discovered that nanoparticles produced by the fungi, Arthrobotrys oligospora, can stimulate the body's immune system and kill cancer cells. This may lead to the development of bio-engineered nanostructures that can be used to treat cancer and other biomedical functions. Arthrobotrys oligospora is a fungus that feeds on roundworms. 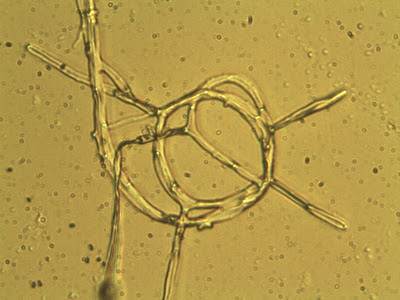 A. oligospora uses rings that form on it long, branching filamentous structure called a hyphae. These rings on the hyphae trap the roundworm which then grows into the roundworm to digest it. There are 71 species of the Arthrobotrys genus which are all predatory fungi. These fungi are considered carnivorous and can be found in various surfaces or substrates such as compost, decomposing wood and animal droppings. The traps used of the A. oligospora are made up of adhesive networks, adhesive knobs, and constricting rings. These fungi also produces a chemical called nematotoxin that is capable of paralyzing nematodes (roundworms). Studying these organisms have lead to the development of biological control agents for nematodes. Arthrobotrys oligospora doesn't live a charmed life; it survives on a diet of roundworm. But a discovery by a team led by Mingjun Zhang, an associate professor of biomedical engineering at the University of Tennessee, Knoxville, could give the fungus's life more purpose—as a cancer fighter. Zhang and his team have discovered that nanoparticles produced by A. oligospora hold promise for stimulating the immune system and killing tumors. The findings are published in this month's edition of Advanced Functional Materials. Zhang commonly looks to nature for solutions to the world's challenges. He and research associate Yongzhong Wang were examining A. oligospora's trapping mechanism for roundworms when they discovered the fungus secretes nanocomposites consisting of highly uniform nanoparticles. Nanoparticles are tiny particles that have been shown to be important in cancer therapies. "Naturally occuring nanoparticles have drawn increasing interest from scientific communities for their biocompatibility," said Zhang. "Due to their high surface-to-volume ratio, nanoparticles have demonstrated unique optical, thermal and electronic properties. In addition, their small size allows them to easily cross cell membranes, an essential requirement for cancer therapy." The researchers investigated the fungal nanoparticles' potential as a stimulant for the immune system, and found through an in vitro study that the nanoparticles activate secretion of an immune-system stimulant within a white blood cell line. They also investigated the nanoparticles' potential as an antitumor agent by testing in vitro the toxicity to cells using two tumor cell lines, and discovered nanoparticles do kill cancer cells. According to Zhang, nature faces many diseases, and offers rich mechanisms for curing them as a result of evolution. Nature-based nanostructures possess near endless diversity, which may offer novel solutions for therapeutic applications. "This study could be the entrance into a gold mine of new materials to treat cancers," said Zhang. "Understanding how these nanostructures are formed in the natural systems will also provide templates for the synthesis of a future generation of engineered nanostructures for biomedical applications." The researchers' approach promises to open up a new avenue for controlling the synthesis of organic nanoparticles using synthetic biology. "This exciting discovery is the first step forward in the development of natural nanoparticle-based therapeutics for cancer treatment and demonstrates the importance of looking to nature for innovation in disease treatment," said Zhang.